Last February I called for a long position in Freeport-McMoRan Inc. (NYSE:FCX) amid temporary weakness within a consolidation phase. Later on in March when the expected weakness reached support I posted an alert for you to catch the opportunity and set the target area with a $19.78-26.30 range. At the start of this month, the initial target at the $19.78 level was hit, producing a 55% profit for the year. My congratulations are to all who took the longs! I also mentioned Southern Copper Corporation (NYSE:SCCO) for those who prefer larger market cap companies. That trade produced a good profit of almost 39% in the same period. However, it doesn’t compare to the 55% profit from FCX even though it set the new record high at the $50.90 breaking above the previous long-term top ($49.82). Below are the poll results where you voted for these two stocks last March. The most of the readers chose FCX because of the better fundamentals which produced a more significant gain. Let’s see how FCX’s price has been developing in the chart from that time. This bird’s eye view chart above shows us that Freeport-McMoRan Inc. (NYSE:FCX) has been in a large complex correction for almost a decade since May 2005 when it peaked at $63.62. This crazy roller coaster had taken the stock price on a wild journey down and up and down again to finally stop at a low of $3.52 last January. The 2011 2-for-1 split had sped up the trip down in the second leg of correction. All the bearish pressure could have been evaporated for many years from now as the Freeport-McMoRan Inc. (NYSE:FCX) triggered a long-term black resistance last month. 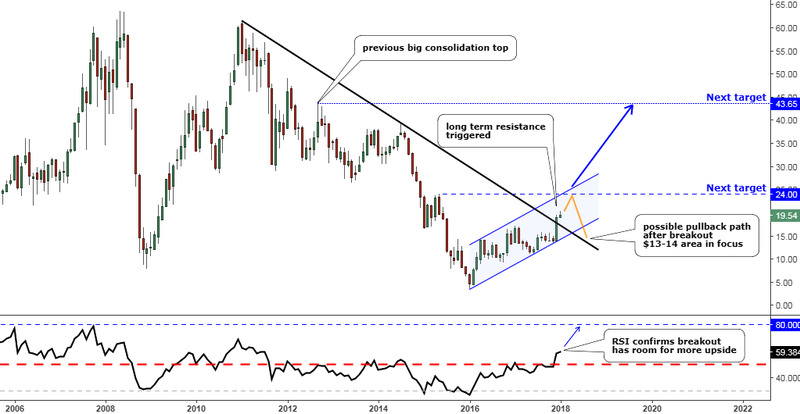 This move was confirmed on the RSI sub-chart below when an indicator exploded above the 50 level in a bullish manner for the first time since 2011 and this is good news for the bulls. Besides that, if this is just the breakout then there is more room to the overbought upside area at the 80 level (blue dashed). It could help the price reach the next target at the $24 level, where the previous small consolidation and the blue uptrend resistance intersect. The market could take a breath there and consolidate down in the pullback as shown in the orange zigzag. Then we should focus on the $13-14 area as there is double support, where a long-term black trendline turned support now, and the previous base for the current move up was formed. This could be another huge opportunity for the next Bull Run in this stock. If the $24 resistance holds, then there is a huge gap to the next strong resistance located at the top of the previous major consolidation at the $43.65 area. It looks too far away right now as the $24 level was a year ago. Who knows what could bring the price there, electric cars maybe? Do you think Freeport-McMoRan Inc. (NYSE:FCX) will hit $24 this year?